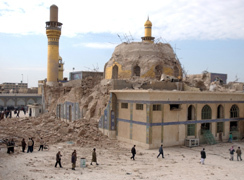 Suspected al Qaeda bombers toppled the towering minarets of Samarra's revered Shiite shrine on Wednesday, adding new provocation to old a year after the mosque's Golden Dome was destroyed. The attack stoked fears of an upsurge in intra-Muslim violence. Prime Minister Nouri al-Maliki's government asked for U.S. troop reinforcements in Samarra, 60 miles north of here, and for a heightened U.S. military alert in the capital. But within hours, three Sunni mosques south of Baghdad went up in flames, reports CBS News chief foreign correspondent Lara Logan, and attackers set fire to three more mosques in the capital itself. Wednesday's Samarra attack also threatened to deepen Iraq's political crisis, as the 30-member bloc of radical Shiite cleric Muqtada al-Sadr immediately suspended its participation in parliament in protest. 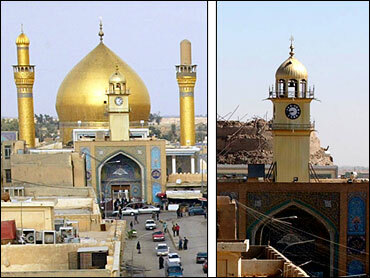 The Golden Dome bombing in February 2006, at one of Iraqi Shiites' holiest sites, unleashed a bloodbath of reprisals — of Shiite death-squad murders of Sunnis, and Sunni bombing attacks on Shiites. At least 34,000 civilians died in last year's violence, the United Nations reported. U.S. military sources say two nearly-simultaneous blasts rocked the shrine, leveling the minarets. How the attackers evaded the Askariya shrine's guard force, strengthened considerably after the 2006 bombing, was a mystery. The attack comes just a day before all U.S. combat forces for the troop surge are set to be in position, adds Logan. Al Qaeda is showing that it can still seize the initiative and undermine U.S. promises to provide security. Al-Maliki quickly imposed an indefinite curfew on vehicle traffic and large gatherings in Baghdad, sending residents rushing to their cars to get out of the city before the curfew came into effect. Traffic on bridges out of the city was heavily congested. Al-Maliki said policemen at the shrine were later detained for questioning in the investigation, and the Interior Ministry said members of "a terrorist group," in addition to the policemen, were arrested in Samarra and were being interrogated in connection with the shrine attack. It did not elaborate. The Wednesday morning blasts shook the Tigris River-side city of Samarra, sending a cloud of dust billowing into the air, said Imad Nagi, a storeowner 100 yards from the shrine. "After the dust settled, I couldn't see the minarets any more. So, I closed the shop quickly and went home." Said nearby blacksmith shop owner Farouq al-Samaraie: "I didn't expect there would be another explosion at al-Askariya mosque because it was already attacked last year." Resident Abdul-Khali Mohammed predicted violence in the capital: "The Shiite militias now will seize this opportunity to kill Sunni families in Baghdad." An indefinite curfew was immediately imposed on Samarra and, as Iraqi army and police reinforcements and U.S. troops poured in, the streets emptied by mid-afternoon, witnesses said. A few hundred U.S. soldiers had been stationed around Samarra but had left shrine security to Iraqi forces. It wasn't immediately clear how the attackers evaded the shrine's guard force, which had been strengthened after the 2006 bombing. The Askariya shrine's dome was destroyed on Feb. 22, 2006, in a bombing blamed on Sunni Muslim militants believed linked to al Qaeda. The mosque compound and minarets had remained intact but closed after that bombing. A Pentagon report cites "the rise of high profile attacks" as one of the negative trends since the American troop surge began, reports CBS News national security correspondent David Martin. The overall level of violence in Iraq remains unchanged, running at more than 1000 attacks a week. The report does cite positive trends. The has been a decrease in sectarian killings, and U.S. military officers say there's been a decrease in the horrific market bombings in Baghdad due to the barriers and checkpoints erected around the capital. In response, the terrorists seem to have shifted their attacks to bridges – there have been 16 attacks since February. The military is reporting three more American deaths in Iraq. One soldier was killed by a roadside bomb in eastern Baghdad on Monday. Another soldier died and two were wounded when their vehicle struck a bomb Tuesday in the southern part of the Iraqi capital. A Marine was killed Tuesday during combat operations in Anbar province. Suspected Sunni insurgents bombed and badly damaged a span over the main north-south highway leading from Baghdad on Tuesday — the third bridge attack in as many days in an apparent campaign against key transportation arteries. Fierce clashes broke out between joint U.S.-Iraqi forces and al Qaeda militants in the city Tuesday morning, leaving two Iraqi soldiers and six militants dead, police and hospital officials said, speaking on condition of anonymity because of security concerns. The fighting also prevented university students at nearby colleges from taking their final exams, according to the provincial police center. A suicide bomber blew himself up at a police station near the Iranian border, killing five Iraqi policemen and wounding 10, the town's mayor said. In the western city of Ramadi, a suicide bomber killed four policemen at a checkpoint, police said. In Baghdad, the prime minister ordered an indefinite curfew, beginning at 6 p.m. Wednesday, on vehicle traffic and large gatherings in the capital. An official close to the prime minister, citing intelligence reports, said Wednesday's bombing was likely the work of al Qaeda, whose militants have recently moved into Samarra from surrounding areas. White House spokesman Tony Snow said it's not clear yet who perpetrated the attack. "It has all the marks of al Qaeda, in the sense that it seems clearly an attempt to inflame sectarian tensions," said Snow. "They're literally trying to blow up Iraqi democracy." Snow said President George W. Bush received a briefing on the situation during a regularly scheduled secure video teleconference with Ambassador Ryan Crocker and U.S. Iraq commander Gen. David Petraeus. The president also called al-Maliki to express his condolences about the attack and praise his efforts to ensure calm. "The president also urged the prime minister to turn this moment of tragedy into opportunity, and demonstrate to the terrorists that the unity and resolve of the Iraqi people will not be broken," said Gordon Johndroe, national security spokesman for Bush. Al-Maliki told Mr. Bush he hopes for progress on important political and legislative benchmarks "in the near future." Snow said U.S. and local officials are more aware this time around of what could follow an attack of this nature. Another difference now is the existence of the Iraqi government, he said. "What happened after the original bombing of the mosque in Samarra — I don't think the Iraqi government or the United States government quite understood what was going to happen in terms of a sectarian reaction," Snow said. "In this case, I think people are acutely aware of what the dangers may be and therefore are moving swiftly to address it as rapidly as possible so that al Qaeda cannot have the same kind of success — twisted success — it had the first time around." In a nationally televised address, al-Maliki said he had ordered security forces to bolster protection of religious shrines and mosques across Iraq. The Shiite prime minister also warned against reprisal sectarian attacks. In Shiite southern Iraq, the reaction to Wednesday's attack was swift. In Najaf, radical cleric al-Sadr called for a three-day mourning period and peaceful demonstrations to mark the minarets' destruction. He criticized the government for not doing enough to protect the site, and said the U.S. occupation is "the only enemy of Iraq" and "that's why everyone must demand its departure," or a timetable for its departure. Later, in Baghdad, the 30-member Sadrist bloc in parliament issued a statement saying they would boycott the 275-seat house until the government takes "realistic" steps to rebuild the Askariya shrine. The action by the Sadrists, whose support for al-Maliki has recently waned, is likely to weaken the Shiite-dominated government and delay adoption of a series of laws needed to build national reconciliation in Iraq. Iraq's top Shiite cleric, Grand Ayatollah Ali al-Sistani, issued a statement calling on "believers to exercise self-restraint and avoid any vengeful act that would target innocent people or the holy places of others." In neighboring Shiite Iran, which has been accused of funding and arming Shiite militias in Iraq, President Mahmoud Ahmadinejad blamed U.S. forces for failing to prevent the mosque attack, and threatened to halt regional cooperation to stop Iraq's spiraling violence. Last year's destruction of the Askariya shrine's dome was also blamed on Sunni Muslim militants believed linked to al Qaeda. The mosque contains the tombs of the 10th and 11th imams — Ali al-Hadi, who died in 868, and his son Hassan al-Askari, who died in 874. Both are descendants of the Prophet Muhammad, and Shiites consider them to be among his successors. The shrine also is near the place where the 12th imam, Mohammed al-Mahdi, disappeared. Al-Mahdi, known as the "hidden imam," was the son and grandson of the two imams buried in the Askariya shrine. Shiites believe he will return to Earth and restore justice to humanity.